After Mixed Results, is Abercrombie & Fitch a Bargain? Despite seeing earnings that fell short of expectations, Abercrombie & Fitch's better-than-anticipated sales suggests that the company's future may not be all that bad. In light of this, is the company a strong investment prospect or should the Foolish investor eye American Eagle Outfitters or Aeropostale instead? After reporting earnings that fell short of estimates and revenue that beat forecasts on May 29, shares of Abercrombie & Fitch (NYSE:ANF) soared 6% for the day. Given these results, is the iconic retailer a strong buy or would the Foolish investor be better served by buying into shares of other retailers like American Eagle Outfitters (NYSE:AEO) and Aeropostale (NASDAQOTH:AROPQ) instead? Mr. Market has low expectations for Abercrombie & Fitch! For the quarter, Abercrombie & Fitch reported revenue of $822.4 million. Even though this represents a 2% drop compared to the $838.8 million management reported the first quarter last year, the company's top line came in 3% above the $797.9 million analysts anticipated. According to the retailer's earnings release, its decrease in sales was driven primarily by an 11% drop in comparable store sales. The main contributor to this fall was the company's International operations, which saw comparable store sales drop 14%. However, Abercrombie & Fitch did report some positive developments relating to its direct-to-consumer (i.e. e-commerce) business. Compared to the same quarter last year, this portion of the company saw its comparable sales soar 27%, led mostly by a 37% improvement in its International market. 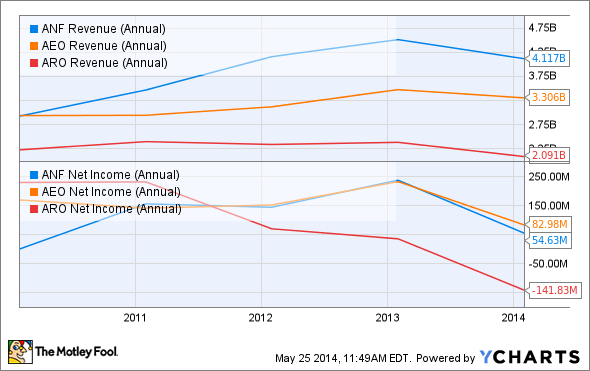 While Abercrombie & Fitch did well on revenue, it fell far short on earnings. For the quarter, the retailer reported a net loss of $0.32 per share. This was far lower than the $0.09 management reported the same quarter last year and handily missed expectations of -$0.19. Despite seeing better-than-anticipated revenue, the business reported lower margins stemming from more clearance items from last fall and greater promotional activity. On an earnings basis, Abercrombie & Fitch's results are reminiscent of Aeropostale's. During its most recent quarter, the business reported a loss per share of $0.98, handily missing expectations calling for a loss of $0.72 and coming nowhere near the $0.16 loss reported in last year's first quarter. Rival, American Eagle, on the other hand, gave its shareholders a positive surprise when it reported earnings per share of $0.02. Despite the fact that this was a significant drop from the $0.14 enjoyed a year earlier, it still managed to beat forecasts by $0.02. But how does Abercrombie & Fitch look over the long run? Over the past few years, Abercrombie & Fitch has been a true growth prospect. Between 2009 and 2013, the retailer's revenue soared 41% from $2.9 billion to $4.1 billion; an 8% fall in store count and 24% aggregate drop in comparable-store sales were more than offset by strong growth in its direct-to-consumer (e-commerce) operations. During this period, the retailer grew this line of business by 168% from $290.1 million to $776.9 million. From an earnings perspective, Abercrombie & Fitch's performance looks even better, with net income rising from $300,000 to $54.6 million; but it's important to keep in mind the fact that the company's earnings aren't as clear-cut as they're made out to be. Excluding impairment impacts in both years and removing the $78.7 million loss from discontinued operations booked in 2009, the company's bottom line rose from $87.9 million to $133 million. Looking at both the top and bottom lines of rivals like American Eagle and Aeropostale, it's not too difficult to tell that Abercrombie & Fitch has come out on top recently. Over the past five years, American Eagle saw its sales rise a modest 12% from $2.9 billion to $3.3 billion, while net income declined 51% from $169 million to $83 million. Making the same adjustments as we did with Abercrombie & Fitch, the company's net income fell 48% from $213.4 million to $111.9 million. Meanwhile, Aeropostale's revenue dropped 6% from $2.2 billion to $2.1 billion, and net income turned from a gain of $229.5 million to a loss of $141.8 million. Based on the data provided, it seems that Mr. Market is alright with Abercrombie & Fitch, even in spite of the business posting lackluster earnings. This performance, in conjunction with attractive revenue and earnings growth over the long run, suggests that the business may have just hit a bump in the road but is otherwise sound. This is especially true when you place its metrics against its peers. Moving forward, there is no guarantee that the business will be able to maintain this lead over the competition. But the fact that it's done a good job so far warrants confidence and should instill in market participants a desire to analyze the company more before writing it off.